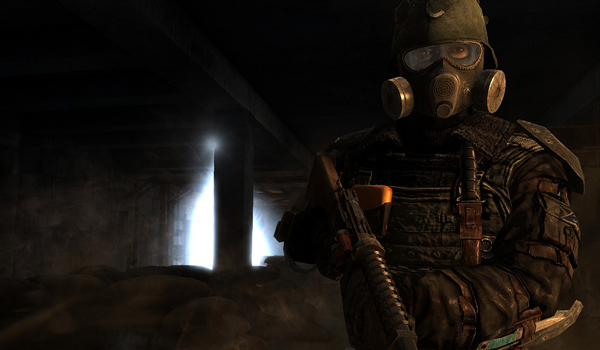 Comparisons between S.T.A.L.K.E.R and Metro 2033 were plentiful even prior to release. 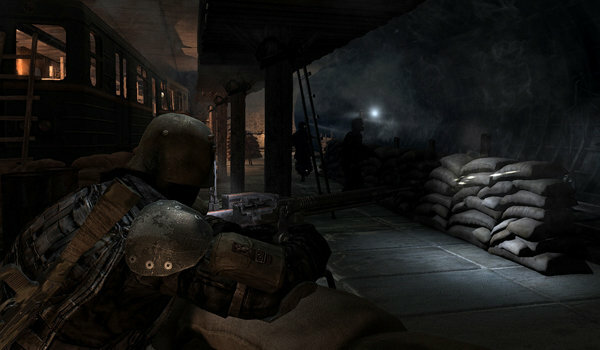 Fallout 3 is yet another title Metro 2033 can be compared to. While it’s accurate to say that 4A Games’ post nuclear apocalyptic world has more than a few elements in common with both titles, is it also accurate to say that Metro 2033 deserves the same degree of praise as Fallout 3 and S.T.A.L.K.E.R? Continue on to find out. Metro 2033 is based upon a novel by the same name written by Dimitri Glukhovskiy giving 4A a fantastic narrative foundation. Unfortunately, despite the strong foundation 4A has to work with, the presentation of the game’s story feels rushed and shoddy. The basic premise is that you are playing as Artyom, an ordinary young man struggling, along with the rest of a broken Russian civilization, to survive the aftermath of a world scorched by nuclear fire. The remaining Russian populace has taken to establishing society in the underground metro system where they spend each day straining under the weight of fear, desperation, and depression. While the premise itself is both heavy and rich, only a portion of the game’s potential to engage the player is fulfilled. 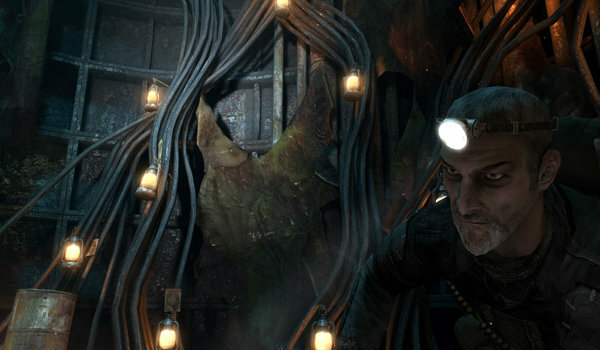 Adaptations from novel to game are rare, and Metro 2033 presents some compelling arguments as to why this is rare. The original novel is comprised of nearly 800 pages which flesh out crucial details such as why is there a resurgence in communist and Nazi ideology, what the true nature of the mutants are, and so on. Such background information is sadly absent from Metro 2033 and, while it is delicious food for the imagination, it also deprives the story of some much needed depth. Due to the 8-10 hour window during which the game unfolds, incongruencies in the story abound because there isn’t sufficient enough time to explain particular plot points before moving on to the next section of the game. On the bright side, what Metro 2033 lacks in storytelling, it makes up for in having a rich atmosphere which can stand on its own legs. Artyom refers to the surface as the ‘bones of Moscow,’ because it is essentially a graveyard dressed as a ruined city. The serpentine metros are dark and morose, creepy and dystopic, enslaved by fear and desolation, and will siphon the glee from your heart. There are two types of company in Metro 2033. The first is the idle chat of escorting soldiers and the salvo of their gunfire. The second is the dank acoustic thud of water drumming up a somber melody in your ears. 4A goes to impressive lengths to put detail, emotion, and relevance into every sound. For example, tripping makeshift soup can alarms or crunching broken glass under your feet will alert enemies to your presence. 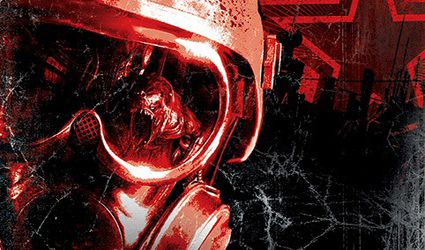 A cast of voices capable of conveying the weight of the story and setting is a major plus for Metro 2033. This fact is slightly undermined by the fact the acting on the part of the children’s’ voice actors is nothing less than God awful. Fortunately, there aren’t many children to talk to. Perhaps one of Metro’s greatest strengths, and greatest weaknesses, are the graphics. First of all, on all high settings, even without enabling DX11, Metro 2033’s photorealistic style is stunning. It truly is a very impressive game visually. Unfortunately, this game does not feel well optimized in the slightest, resulting in rather poor performance even on rigs that should be able to handle the game’s dark beauty. This problem is further compounded by the fact that there are only 4 presets for the graphics options, with no capacity to adjust individual settings. While I can certainly appreciate the efforts put into making the PC version of this game look like a true step up from its console counterpart as opposed to simply upping the texture resolution, poor optimization makes the game’s degree of fidelity a double edged sword. To add this, there doesn’t appear to be a V-Sync option and the screen tearing can be fairly bad at times. 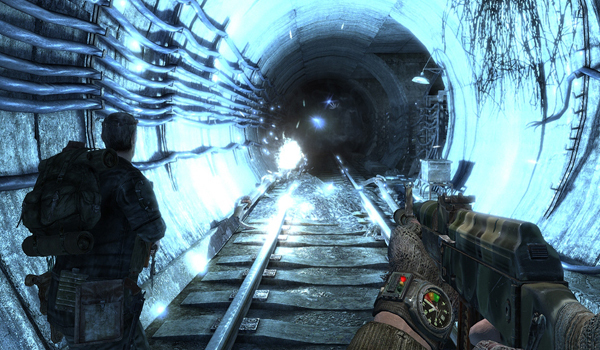 As a shooter, Metro 2033 succeeds marginally well. The gunplay, while not particularly new or exciting, is solid. The combat itself is intense and highly encourages stealth play without outright forbidding frontal assaults. Some of the longer encounters will have you tensing your muscles and praying that the next enemy to die is the last…but it won’t be. Part of this intensity stems from the fact that each enemy tends to, at least on higher difficulties, be a bullet sponge. Speaking of which, one of the single most intriguing game play elements found in Metro 2033 lies with your currency, which may double as your ammunition. There are two ammo types, dirty bullets produced after the apocalypse, and pre-nuke military grade bullets. The former are weaker and lack any value, while the latter are used as currency, and they pack a significant punch. The idea is that you will need to compromise, trading your military grade bullets for other essentials, such as first aid kits, dirty bullets for particular weapons, and gas mask filters. That’s the idea anyway. This concept falls short once you begin to realize that ammo and gas mask filters, even on the highest difficulty setting, are perfectly abundant, and that your health regenerates steadily over time. One thing in particular must be noted, there isn’t a great deal of handholding in this game. While it is a very linear game, you are still forced to think on your feet and figure things out for yourself based upon subtle auditory and visual cues along with your own inferences. If you aren’t checking your watch, and you ignore Artyom’s hoarse breathing, for example, you will suffocate. Some encounters, and even entire levels, can be unfair to the point of frustration. However, this isn’t necessarily a strike against the game. It is an almost inexplicable ‘good’ frustration that comes with the spirit and territory of survival horror. Where the game crosses the threshold between fun frustration and outright aggravating is when you are introduced to the horrors of Metro 2033’s numerous game breaking bugs which may force you to restart a subchapter, or the game’s poorly executed and archaic checkpoint system. The checkpoints never seem to get it quite right. There are times where you will spend ten minutes on a fight only to die to the last enemy and be forced to replay the entire fight due to a lack of any checkpoints. At others times, times which are far more infuriating, you may find yourself in a perpetual loop of death due to the checkpoint placing you in a situation the likes of which you cannot survive, and again forcing you to restart the subchapter hoping luck is on your side. A great deal of rage and aggravation could be averted with a more coherent save system. Fortunately, each subchapter is relatively short and allows one to go back through each subchapter to hunt for achievements missed on the first play through. On the other hand, the game’s replay value comes to a grinding halt after those 15-20 achievements are gained. Given that the game is only 8 hours to begin with, one would imagine that 4A would focus a little more on giving the game greater replay value, but alas. Short of doing a 2nd play through just for the sake of it, players can expect to see all the game has to offer them in 12-14 hours at the most, and that is being somewhat optimistic. Overall, Metro 2033 is a strong enough game not to be sunk completely by its flaws, but is unfortunate to see a game with so much unrecognized potential, and such poor execution on things that are otherwise stellar, such as shoddy performance optimization, poor storytelling, low replay value, and a horrendously frustrating save system. In the face of all of these significant flaws, though, there are also things that the game pulls off in stellar fashion. Metro 2033’s reach simply exceeds its grasp, falling short of being a terrific gaming experience due to the heavy weight of some avoidable issues, resulting in it being slightly above average, rather than superb.